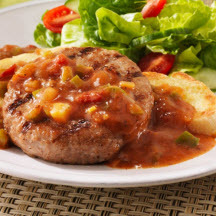 Turkey burger patties served on slices of French bread and topped with a spicy, Cajun-style vegetable gravy. For the Creole Gravy: Melt butter in a 2-quart saucepan on medium-high heat. Add garlic and cook 1 minute, stirring frequently. Stir in peppers, onions and celery and cook 5 minutes, stirring occasionally. Stir in tomatoes, gravy, Cajun seasoning and Worcestershire sauce. Bring to boiling; reduce heat. Simmer, uncovered, 15 minutes. Meanwhile, spray medium skillet with cooking spray. Heat on medium heat. Add turkey burgers. Cook 8 to 10 minutes, turning half way through cooking time until burgers reach an internal temperature of 165°F (73.8°C). For each serving, place 1 slice of bread on a plate. Top with cooked burger and some of the Creole Gravy. Nutritional Information Per Serving (1/4 of recipe): Calories 486; Fat 16g; Cholesterol 94; Protein 34g; Saturated Fat 7g; Trans Fat 0g; Sodium 2838mg; Carbohydrates 56g; Sugar 9g; Iron 0%; Fiber 0%; Calcium 0%. Recipe and photograph provided courtesy of Butterball, LLC.